Did you know that New York’s first skyscraper was built in 1888 but later demolished in 1914? 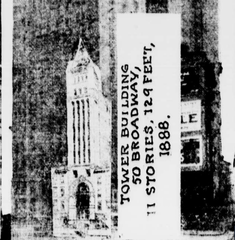 The Tower Building was arguable New York's first skyscraper and it was also the first building with a steel skeleton structure. The plans were filed in April 1888 and construction was completed in September 1889. Though it was 33m deep, the building had just 6.5 m of frontage on Broadway, necessitating its novel design. The building was 11 stories high (39m). The property demolition started in 1913 due to the lack of tenants. If you need help with your next project, please contact us on 01892 534455 or click here.